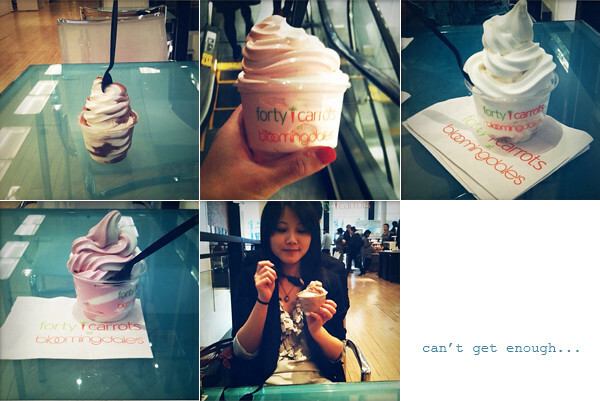 So I've got a horrible addiction to the frozen yogurt at the Forty Carrots cafe in Bloomingdale's. Here are five separate occasions in the last 2 months or so. The best part is how high they pile the yogurt! No skimping here. :) I remember a while ago, they had a peanut butter flavor that I loved. Sadly, I haven't seen it since. I usually take my yogurt without toppings, but I'm tempted to try honey with the plain next time. Also...once you buy 7 yogurts, you get your next one free. Did I mention I'm a sucker for "Buy x amount, get the next free" loyalty cards? Loyalty cards keep me coming back every time without fail, haha! And I hate carrots -- but a place called Forty Carrots that serves froyo? I can get behind that! I love froyo! I'll have to try out Bloomy's version, then. Must be good if it's from there. :) Cute pics! this post makes me smile! so adorable!